The summer of 2012 is the year where some of the featured films have some connection with 10 years ago. Those films include the Amazing Spider-Man reboot derived the successful Spider-Man movie directed by Sam Raimi & Ice Age: Continental Drift, the 3rd sequel to the CGI family favorite with the same name. Added to the list is the 3rd sequel to The Bourne Identity, The Bourne Legacy. Unlike the previous Bourne movies, the focus is shifted from Bourne himself to a different specialized agent with Bourne-type skills. Will this latest twist on the franchise help or hurt the legacy of this franchise? The movie begins in the same timeline of the previous Bourne Ultimatum film as Operation Operative agent, Aaron Cross (Jeremy Renner) as he is on a training exercise in Alaska. After former Air Force Colonel Eric Byer (Edward Norton) is forced out of retirement to help deal with exposure of the Treadstone project & Operation Blackbriar, he decides to eliminate any trace of these programs including destroying any and all existing agents that could pose a threat (i.e. Agent Cross). Upon escaping annihilation, Cross eventually meets up with Dr. Marta Shearing (Rachel Weisz), who holds the key to helping Cross achieve what he’s been looking for. All the while, they try to evade being caught by a Byer & the CIA. The cast and overall acting in The Bourne Legacy was pretty entertaining. As Jeremy Renner is able to hold his own & bring the action as he plays Aaron Cross. In this movie, Renner is somewhat reminiscent of Daniel Craig’s rendition of James Bond. Rachel Weisz gives her all into playing Dr. Marta Shearing, thrust into the fast-paced world of espionage & travel. She holds nothing back as she gives a wide variety of emotions to get the job done. Edward Norton’s portrayal of a government official that tries to get a handle on Cross is great to behold. The action sequences seemed to more a bit more raw & rugged than the previous Bourne movies. The shooting/fighting seemed to have their own personality while matching the pace & feel of the Bourne movie predecessors in a way that works. Unfortunately as much the actors try, it can only go but so far to save this movie. For one, there seemed to be less action in comparison to the previous Bourne movies. 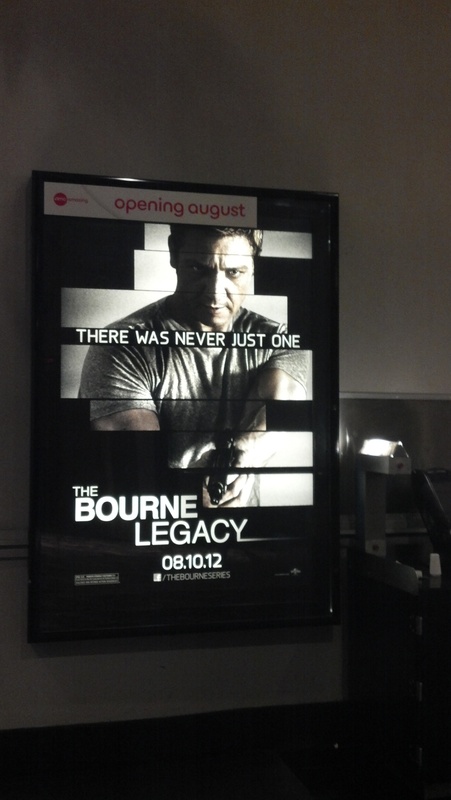 The story didn’t seem as thrilling or a well fleshed out as the previous Bourne movies. The beginning pace is slower, as it really takes it’s time to establish the expository information. While these are critical parts of the film, these same parts of the movie may overwhelm some viewers as they may feel like it’s too ‘talky’ for an action film. There was a story element missing in Legacy that was in the other Bourne films. While the film builds off of events from the previous movies (including that picture of Jason Bourne seen in every Bourne movie, which Matt Damon is probably sick of look at right now), what’s missing is a certain unique element underlying within this story. When watching each Bourne movie, they’ve had this lone story element which made the movie that much more interesting. Without it, it’s just another action movie with traces of Jason Bourne. While I do not know how to make my blog mobile friendly at this current time, I will continue to look into it. Thanks for bringing this up & I hope that you’ll continue to visit the page.